Dual Bay Hard Drive Docking station supports standalone offline clone function, easily lets you duplicate or clone 2 Hard Drives without connecting to the computer, or can be connected to a computer system for use as an external hard drive dock. - Plug in 2 hard drives, and identify Original Disk and Target Disk. - Connect power supply then switch on power. - Easily press "Clone" button, then offline clone will start. -Compatible OS: Windows XP/Vista/7/8/10(32/64-bit), Mac OS, Linux. - Target Disk must contain more space than Source Disk. - Any bad sectors on the drives in use may prevent duplicator and cause overheating, which damages the station. - Highly efficient 12V3A power supply guarantees a stable and reliable energy supply. Supports all 2.5''/ 3.5'' SATA I/ SATA II / SATA III HDD SSD (up to2 x 10TB); Plug and play, no driver needed, hot-swapping, easy and quick, easy to set up and disassemble; Perfect solution for backup & processing IT data, batch processing data, file transfers, etc. Super speed USB3.0 interfaces with data transfer rates up to 6Gbps,10 times faster than USB2.0, backward compatible with USB2.0 and 1.1; automatic sleep mode after 30 minutes of inactivity saves energy. 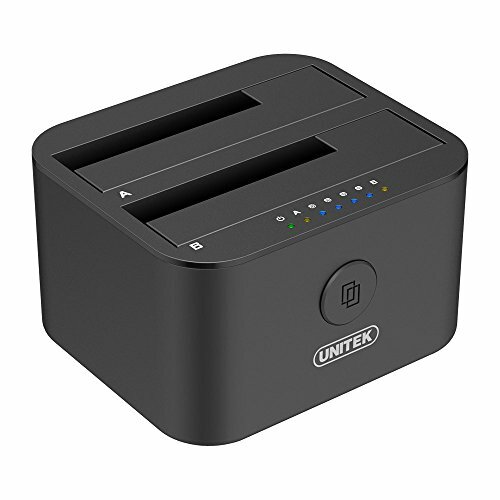 Supports UASP, provides faster transfers up to 70% faster read speeds and 40% faster write speeds over traditional USB 3.0; Highly efficient 12V3A power supply makes sure a stable and reliable energy supply. Compatible with windows XP / Vista / 7 / 8 / 8.1 / 10 (32 / 64 bit), Mac OS 10.10 or higher, Linux, Standalone duplicating / Offline Clone operation with LED indicator offers 1:1 copies of hard disks at a rate of up to 485 MB/s. We believe in the quality of our products so much that a 2-YEAR guarantee is provided. 24h friendly customer service and email support. Package includes: 1 x USB 3.0 to SATA Hard Drive Dock; 1 x 3.9ft Data Cable; 1 x 12V 3A Power Adapter; 1 x User Manual.